I had a berry good day yesterday. My rhubarb was ready to be harvested and I bought a bunch of local strawberries. 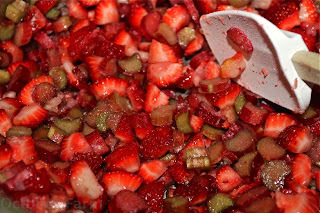 For the pies, I cut the rhubarb into small dice and cut the strawberries to about the same size. 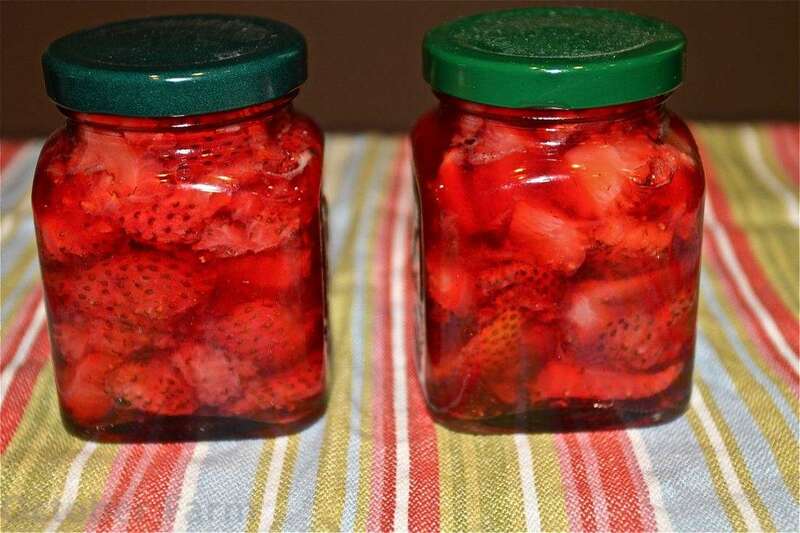 For my jam, I like big pieces of berries so I quartered the strawberries. 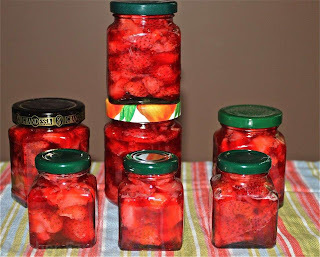 This strawberry jam could not be easier. 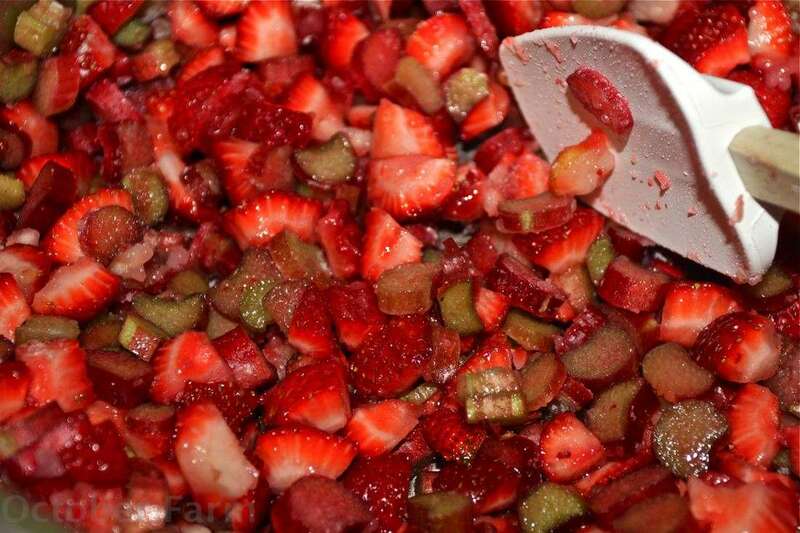 I add a bit of sugar and some lemon zest to the berries, sit it on the burner and bring it to a simmer. 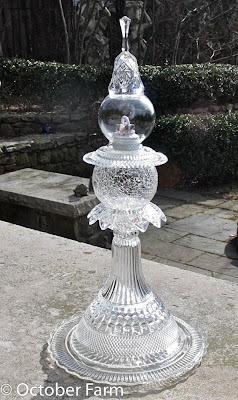 Since no liquid has been added, it thickens quickly. Most of this is going to neighbors this next week so no need to can it. The jars were hot and sterilized and some of them sealed just by tightening the lids. this will last for quite a while in the refrigerator and can also be frozen. It never lasts that long around here. 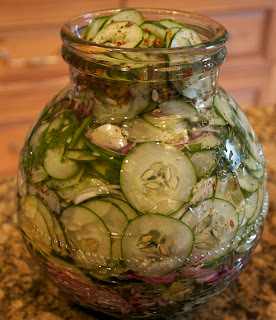 When my friends receive a jar of this with a basket of fresh biscuits they will be very happy. None of my friends cook so they depend on these treats. The rhubarb/strawberry mixture was turned into mini pies. They were baked with a bit of cream and sugar on top. 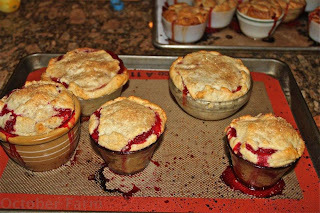 I had some leftover sour cherries from the pies I made the other day and I also had a basket of raspberries so a few of these were baked too. This is how you know a pie is done. 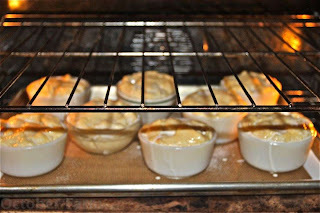 The filling should be bubbling and oozing over the edge. 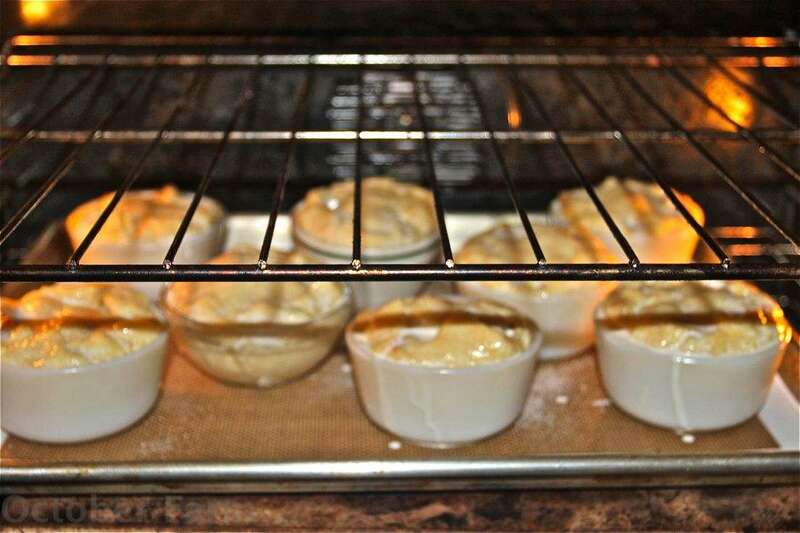 I can tell by the smell if a pie is done baking. These mini pies just fly out of my house. If I made large pies no one would take it because it would be so messy. But my kids can just grab these and run with no mess at all. 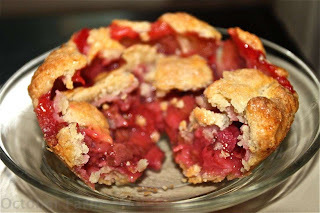 The Blog Tech really Bogarts these pies. 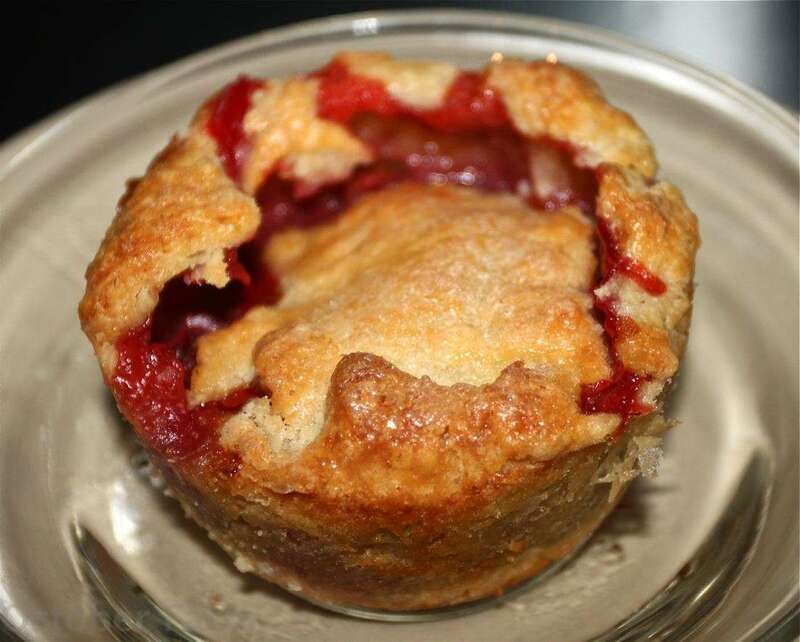 Pie perfection.....what screams spring more than a strawberry/rhubarb pie? Sorry for the out of focus pic! You sort of get the idea though! 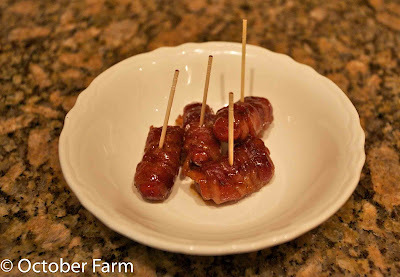 ***I am trying a new recipe today that I think is going to be a winner. If so, I will post it tomorrow. ***Remember to enter the new summer salad plates giveaway by clicking on the button on the sidebar! 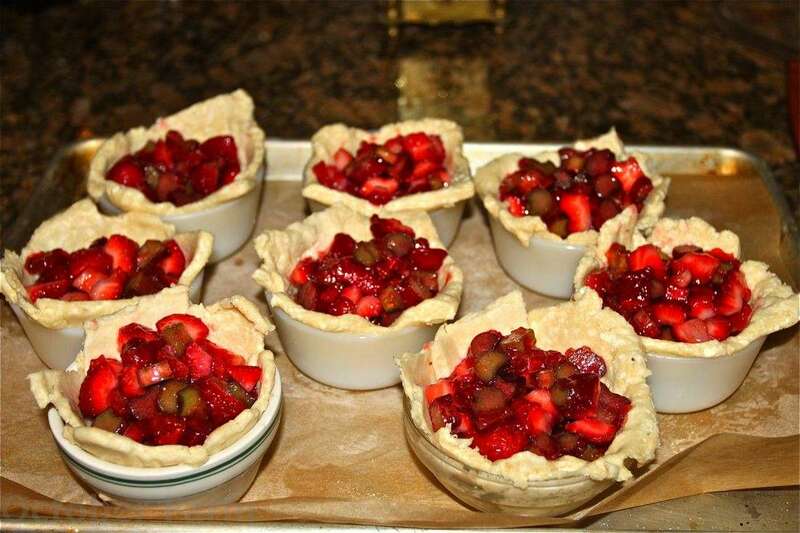 Why do you torture me so with photos of these delicious little pies? Why??? 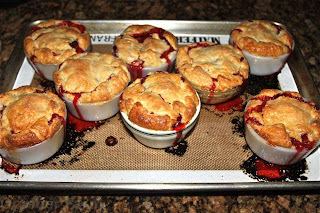 Mmmm... there's nothing I love more than homemade Strawberry jam &hearts... and those pies look out of this WORLD! 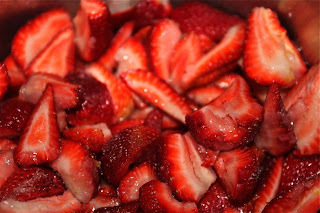 Yummy - I love strawberries. We planted some last year but the you know whats ate them. Berries! Luscious and Tasty! They are all beautiful. The jars of jam are so colorful. G'morning! I swear..you are one of the most amazing women! I come here and am always thinking I must get back to cooking more..or gardening more...or redoing some item that just plain needs redoing..
OMG I LOVE Strawberry-Rhubarb pie!! Still warm from the oven with vanilla ice cream mmmmmmm. I'm not much of a baker but I am bribing a friend to make me pie this summer. I agree with Debra and Christer! You are torturing me with your pies!!!!! mmmm...if I close my eyes I can almost smell those delicious looking pies baking! You are lucky i do not live near you...you would find me often on your front step begging! The pies and jam look so yummy. We are getting about a gallon of strawberries a day, and they've just started. 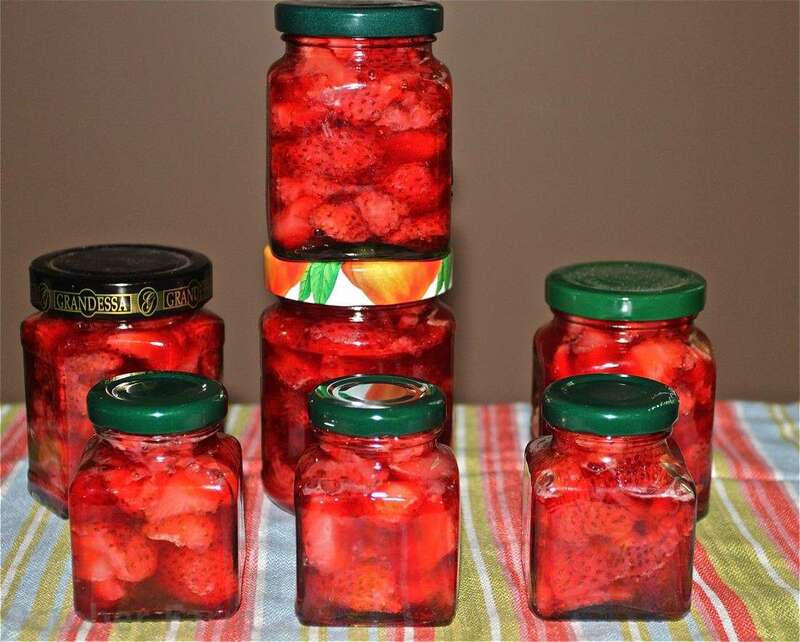 I will be making lots of jams next week hopefully. How scrumptious! must..make..something so delicious! You've inspired me! Can you mail me some of those mini pies???? YUUUUMMMMM! 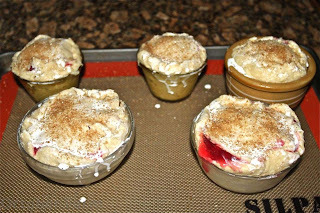 strawberry rhubarb is one of my favorite summer desserts. Those pies look amazing. Hmm ... I have a bumper crop this year ... perhaps a pie is in my future!